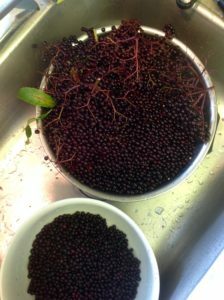 I’ve been a smidgen obsessed with elderberry this year and it has heard my prayer. 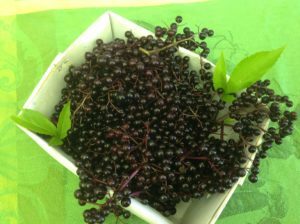 Not only did my husband gift me a beautiful elderberry bush for our yard, but a neighbor with a gorgeous mature bush gave us the green light to enjoy some of his bounty. So, I’ve been up to my elbows in elderberry. 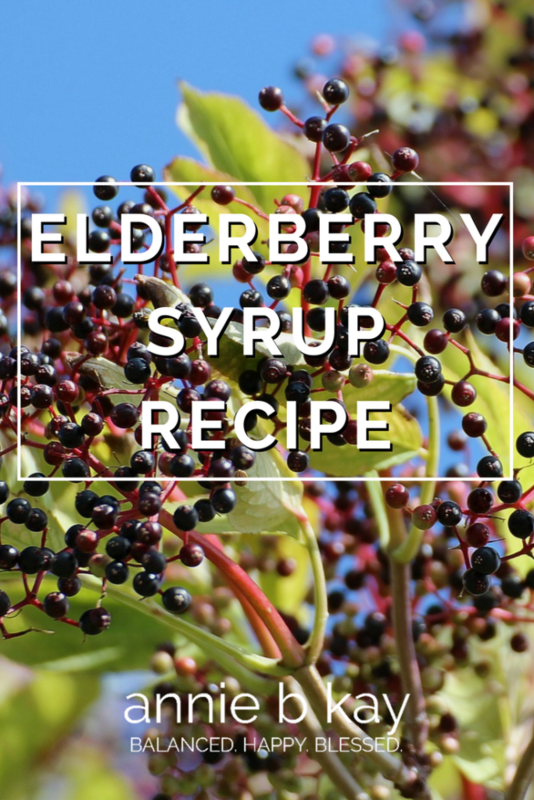 Elderberry is a folk medicine immune supporter, and even today you can find it in commercial cough syrup and lozenges. 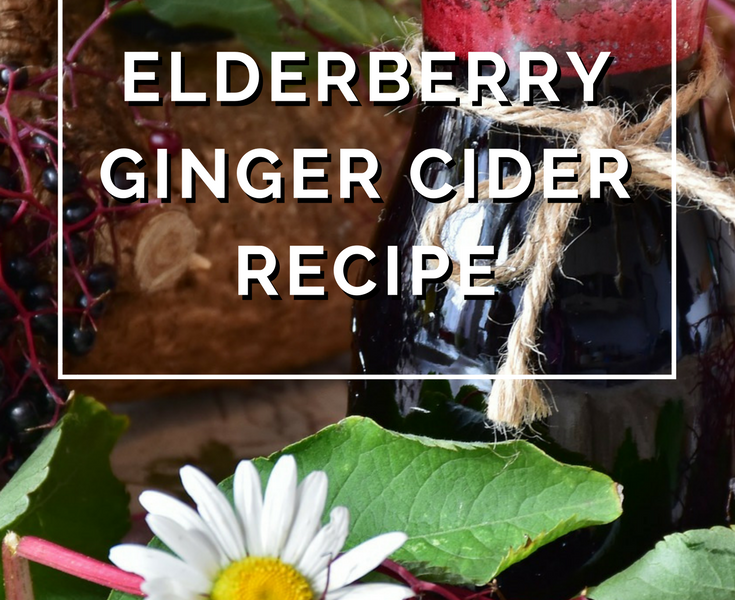 Clinical trials suggest that it reduces the duration of the flu, and it may have antiviral, anti-inflammatory and anti-cancer properties. From a plant-spirit energetic perspective, elder aids with journey work (such as shamanic visioning) and is, simply, an elder filled with primordial wisdom. 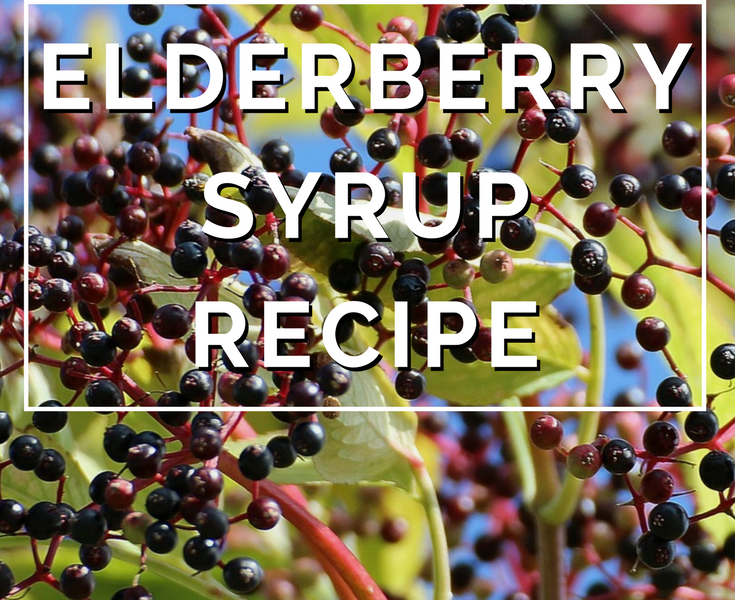 Most elderberry syrup recipes call for about 2/3 cup of berries for a season’s supply of syrup. Well, because I had a bucketful, mine is a little stronger! It’s delicious and rich. 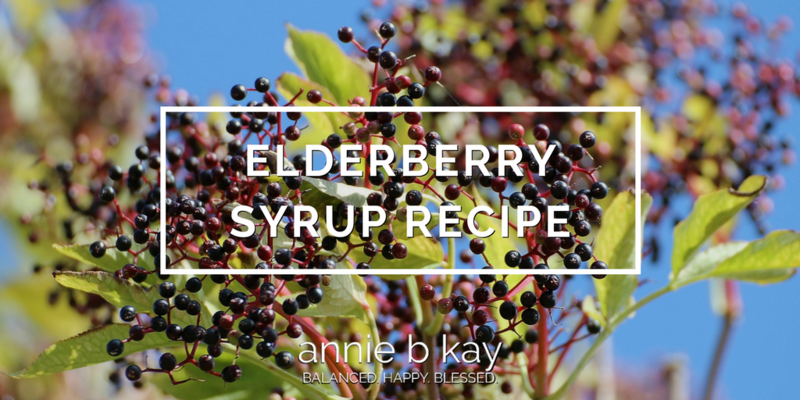 In the literature there are warnings about elderberry irritating the gut if taken raw and/or in excess, so you can overdo it! I intend to take 1 tsp daily for 3-5 days at the first sign of cold or flu. 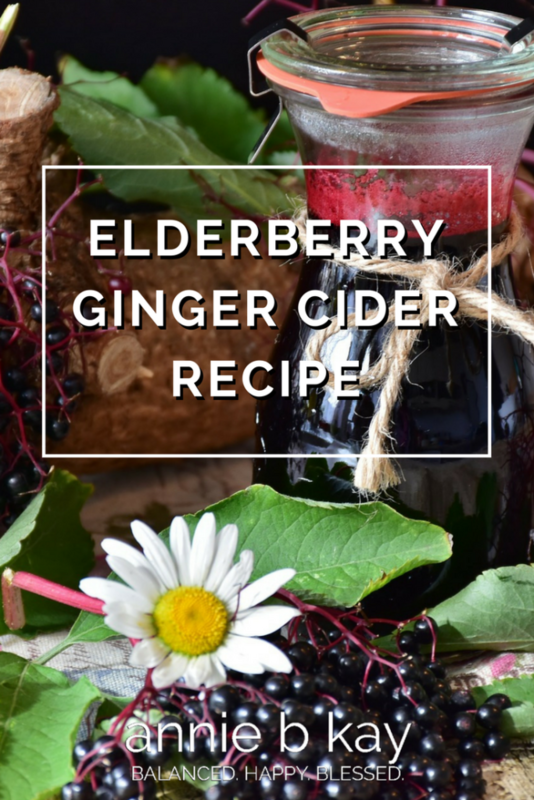 Give yourself a couple hours to make this start to finish. This recipe made about 6 cups of syrup. 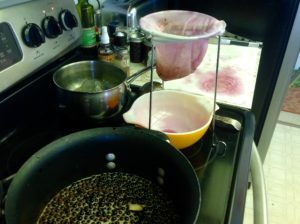 In addition to a large pot for cooking and processing, you will need a strainer or jelly bag, and containers for your syrup – I used jelly jars and processed them as if I were making jelly to give nicely sealed jars for gifts, and also kept a batch in a larger unsealed jar in the fridge to be used over the next 3 months by my family and me. Jelly jars come with the glass jars, a flat sealing lid, and a ring that twists over the sealing lid to keep it on the jar. 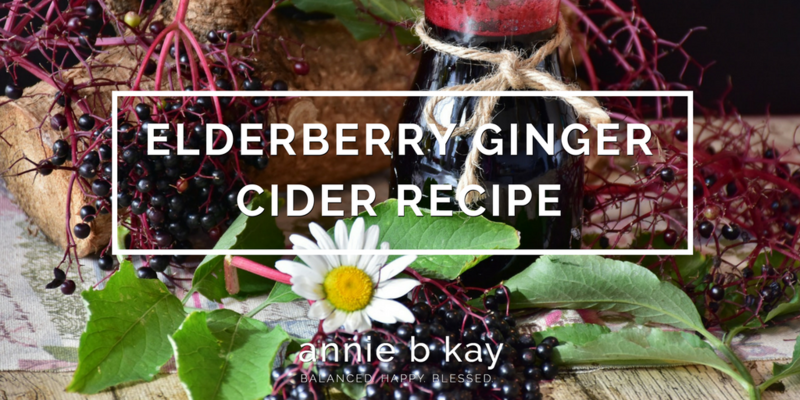 Place berries, spices, ginger and honey in a large pot and bring to a rolling boil. Stirring, add pectin and boil for another minute. Lower heat to medium and simmer for 15-17 minutes. Strain through jelly bag, and place into jars. As I mentioned I used jelly jars and processed them like jelly, which entails boiling the jars (pouring hot liquid into a cold jar can make it crack) and sealing the lids. After filling the jars with syrup and topping with sealing lids, I tightened the lid rings, and placed jars upside down for about 5 minutes. This helped them seal. Once that’s done, I check to see if the jar sealed by pressing the center of the lid. If I can push the lid down and it pops up, no seal. If the lid is concave and pressing it doesn’t move it, it’s sealed. Often, lids will seal throughout the day – I can hear “pop” from the next room when a lid seals. Jars that don’t seal need to be refrigerated, and the syrup used within 3 months. I keep those that seal all season. Making your own jelly and syrup can be a sticky mess, but I am always amazed by the wonderful smell, color, and flavor of home-made preserves. It’s a fun thing to do with family or friends who are into it. Little jars of your handcrafted goods make terrific gifts. Make sure not to give away unsealed items or you may be gifting a nice jar of something not-so-healing.